We highly recommend that a qualified engineer clean your franking machine when switching between red and blue franking ink or vice versa. Switching franking ink types without professionally cleaning the machine may cause damage to the machine. I keep asking for this cartridge and just getting labels! Tried time and time again. We no longer supply the envelopes but if you use the link below it will give you all the details needed for recycling your cartridges. For the Pitney Bowes franking machine DM100i I have bought red ink cartridges previously, but today only blue is showing. Do you still sell the red ink ones? Hi, I'd like to ask about compatibility between my model DM100 and the ink cartridge for DM100i. Are they similar? Are DM100i cartridges used in DM100? Yes, the DM100 and the DM100i franking machines take the same cartridge (Red ink cartridge 793-5). If we were to buy the alternative inks for our DM100i franking machine and it damaged it in any way, does your guarantee cover us for the repair of the machine? What if compatible Pitney Bowes DM100i inks damage my printer? Our compatible Pitney Bowes DM100i franking machine cartridges are Royal Mail approved and are strictly tested for consistent operation in your franking machine. If in the unlikely event that your printer is damanged by using one of our products, then our guarantee will cover you for repairs to your machine. Crisp and clear documents are what the Pitney Bowes DM100i printer does best. In the end your Pitney Bowes DM100i will consume all of your printer ink, and when that does happen you'll quickly find that ordering Pitney Bowes DM100i ink is often costly. Thank goodness you do not need to get worried about coughing up the high costs you'll uncover on the main street because now at Cartridge Save you can find all the Pitney Bowes DM 100i cartridges you will want at very small prices. Save more money on your ink by ordering online with Cartridge Save! There's absolutely no reason why you should spend so much on the DM-100i original cartridge or DM100i compatible ink down the high street when it is far more easy to save a handful of cash buying online with Cartridge Save. Enjoy complete peace of mind when you order your DM100i ink cartridges from us because they all are covered by a cast iron money back guarantee. Be mindful of the fact that each and every purchase comes with free delivery, mostly arriving at your door on the next working day! The Pitney Bowes DM100i is one of the most advanced franking machines in the market. It is quiet and efficient, making it more convenient to process mail, especially in a busy office setting. The DM100i can frank and mail up to 9.5 mm-thick letters, and larger packages can easily be processed with the use of self adhesive strips. The Pitney DM100i can even be pre-set for the most commonly used processing settings, allowing businesses and office mail rooms to save time and money. This device is bulkier than older franking machines from Pitney Bowes, and its standard scale capacity is only 2.5 kg. Measuring 230x345x400 mm, the Pitney Bowes DM-100i printer is not much of a space-saver, although the machine needs this space to process letters more efficiently. It is designed to process up to 9.5 mm-thick envelopes and it features pass through feeding method, making the process smoother. The Pitney Bowes DM100i franking printer has a small LCD display, which can be found right in the front panel, along with the control panel. The Pitney Bowes DM100i is beneficial for offices that do a lot of mailing each day. It stores updated postal rates (including international rates) for efficiency, preset job memories are available so users don't have to input settings when doing repetitive tasks. The DM100i even has a built-in Smart meter, which allows users to frank VAT services. 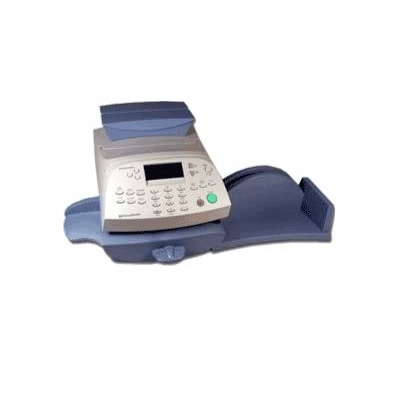 One disadvantage of the Pitney Bowes DM100i franking machine is its size, which is much bulkier compared to the compact base model. Additionally, this model does not have a label dispenser.